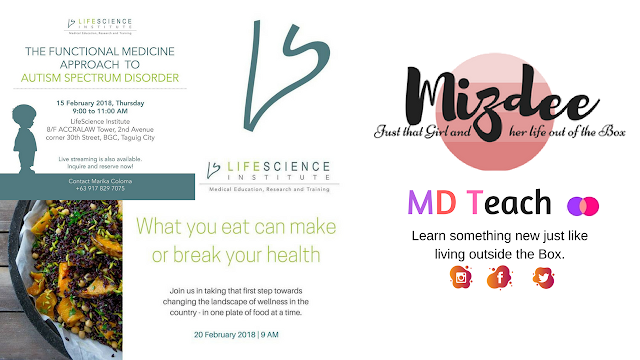 "Mizdee becomes the brand name of Ms. Divine as she explore passionately the earthy lifestyle with a personal touch by yours truly and continuously educate and learn about nutrition and her profession. To organize things here in her blog, Every Tuesday will be all about Nutrition (MD Teach - Out of the Box Educational Stories) while every Friday will be her Lifestyle (Style by Mizdee - fashion, beauty, entertainment and such) segment." 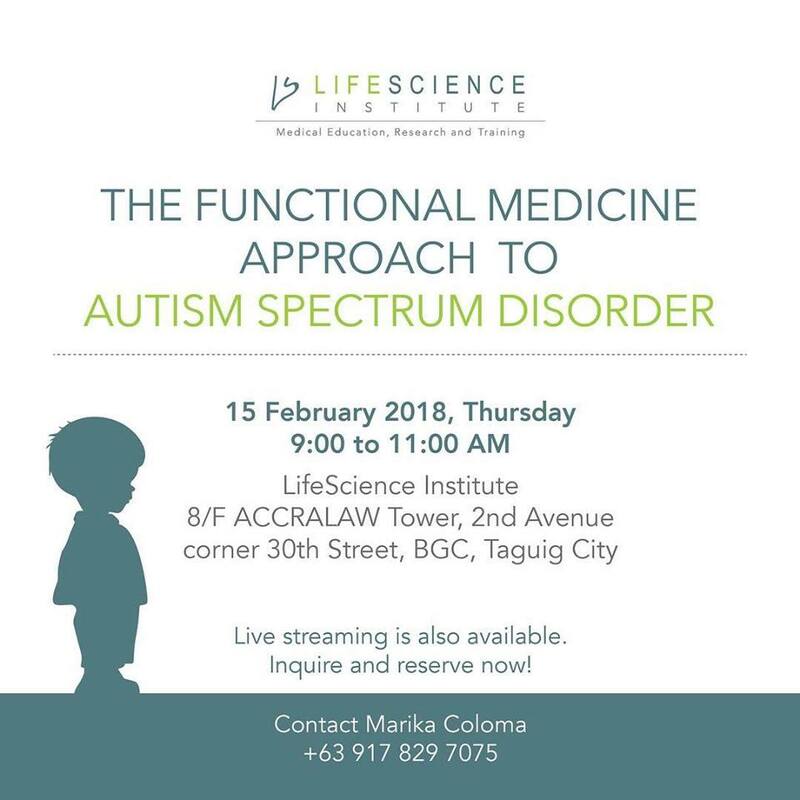 Just last February 15 and 20 of this year, I was able to attend one of the webinar by Life Science Institute that tackles about Functional Medicine and the Autism Spectrum Disorder and Introduction to Functional Nutrition. For this post, I'll be sharing the Highlights of each of the Webinars. Just a few reminder this will be a long post but I still gonna try to summarize it more. Functional Medicine is another way of dealing with patients and with their diagnosis. In comparison with the Conventional Medicine, Functional Medicine are health oriented and look for the underlying cause of disease as an approach of management. So for our first topic, it will be about the functional medicine approach to Autism Spectrum Disorder or ASD. But before we jump start to the relation of Autism and Functional Medicine Approach, let us first discuss Autism. The following information are gathered and slightly revised from the Speaker, Dr. Raymund Joseph Yee Escalona. Autism is described as a system-biology dilemma or the group of organs in human body, that supposedly work together to perform a task, are currently impaired or having malfunctions. This malfunction usually take place during the earliest stage of human development and mostly targeted the brain. 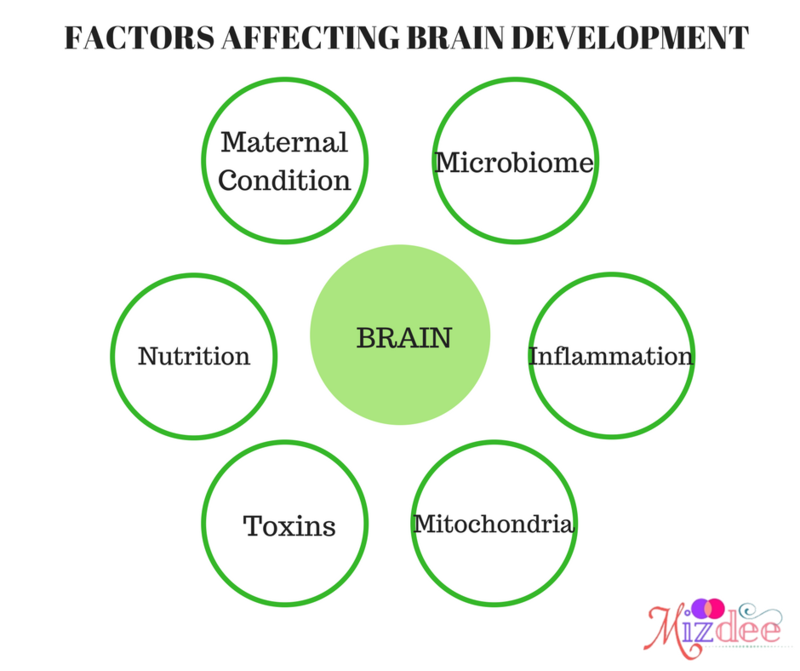 There are a lot of factors that affect the brain development and functions, but Dr. Escalona have only focused to Six (6) factors that have significantly affects the brain and somehow linked it to ASD (Autism Spectrum Disorder). It will start during Conception. The health of the baby will depends to the Mother's health so whatever the condition of the Mother will reflect or affect the development of the baby. Fetal brain is growing larger and more complex, as new cells, specialized regions, and communication networks form. During this time, anything that disrupts normal brain development may have lifelong effects on the child's sensory, language, social, and mental functioning. Science says that almost 80% of the gut health will affect the immunology of the person especially for the baby. The gut microbiota makes critical contributions to metabolism and maintenance of immune homeostasis and may control the central nervous system (CNS) activities through neural, endocrine, and immune pathways, it has been hypothesized the active role of the gut microbiota in ASD pathophysiology. Excessive inflammation in the body can impact brain development. Exploring the causes of inflammation can help to reduce the symptoms of autism. Some common causes include food allergies/sensitivities, imbalances in the gut bacteria, and infections. Mitochondria are cell structures, or “organelles,” whose primary function is to supply a cell with energy. In essence, they turn sugar and fatty acids from food into the energy-carrying molecule adenosine triphosphate (ATP). Virtually every cell in the body depends on ATP and mitochondria for energy. As a result, mitochondrial disorders can produce a wide variety of symptoms. The most common involve body systems that use a lot of energy. Muscles are a classic example, and mitochondrial dysfunction often produces muscle weakness and fatigue. When mitochondrial dysfunction affects the gastrointestinal system, symptoms can include constipation or diarrhea. When it affects the immune system, it can lead to frequent infections. Mitochondrial disorders can likewise cause failure to grow, kidney dysfunction and a many other medical problems. The brain is another energy-demanding system. Here, mitochondrial dysfunction can produce such symptoms as developmental delay, hearing problems and seizures. 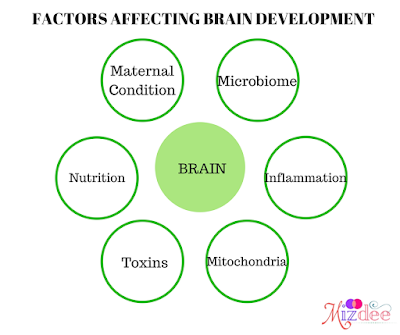 Previous research indicates that fetal and early childhood exposure to toxic metals and deficiencies of nutritional elements are linked with several adverse developmental outcomes, including intellectual disability and language, attentional, and behavioral problems. These factors can affect and aid the symptoms of an individual with Autism Spectrum Disorder. Science and researches have provide evidences to link these factor to the brain development of a child, and the possible malfunction of the system have result the patient to be develop with Autism. The action and other symptoms of ASD can be reduced by targeting the treatment using these 6 factors and that's how Functional Medicine Approach works. 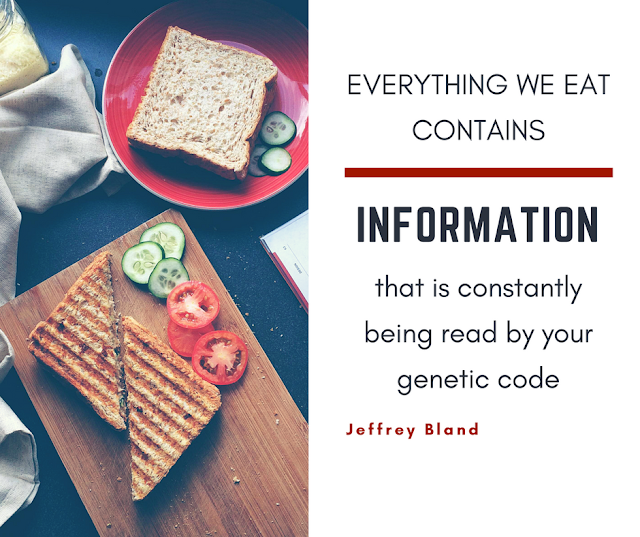 After understanding these factors and linked it to autism spectrum disorder, we can now jump start to the next topic which is specifically about Nutrition and its significance in the Functional Medicine Approach. As discussed, Nutrition have shared enough role in alleviating ASD. So just like treating other diseases, Nutrition will play a big role in the Functional Medicine. 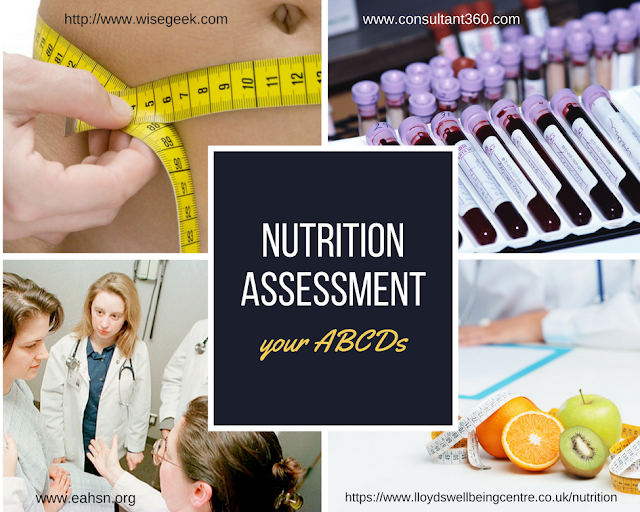 Previously, it was discussed that just from the mother's nutrition to the gut health of the child, it will greatly affect the development of a child so when the medical approach focal point is nutrition, the patient profile will surely improved. Dr. Escalona cite example for help us understand the importance of nutrition to our health. He gave as fresh evidence from different researches, studies on how effective nutrition therapy in the health of an individual. 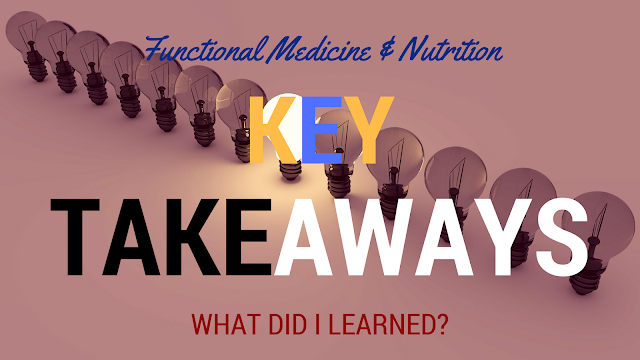 Why do we need Functional Nutrition? The widespread occurrence of complex chronic disease are diet and lifestyle related and the approach of functional nutrition is to dig through the patient profile individually because each case is unique. 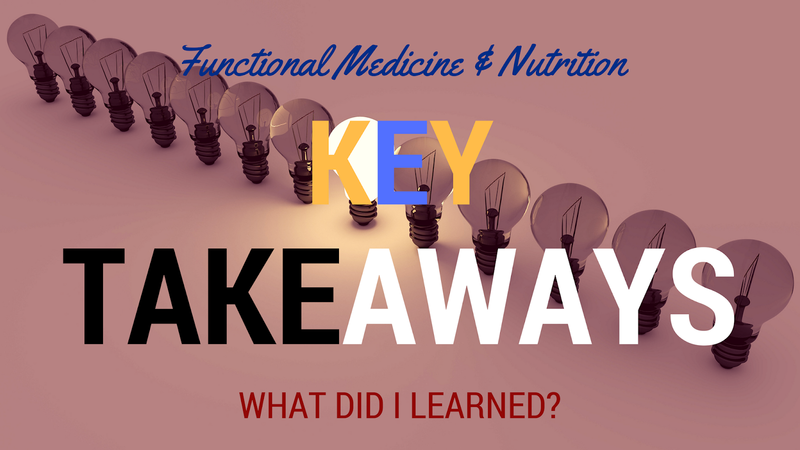 Functional Nutrition, as previously discussed, focal point is to improve once life through achieving an optimal nutrition care process. 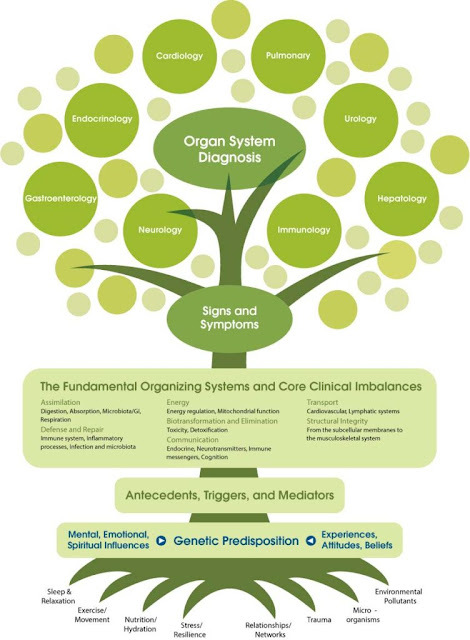 It is the hallmark of functional medicine approach that the care given to the patient are based to its profile not by giving "generalized" approach. 1. Gather the ABCDs of the Patient. Anthropometric Measurements gathered data about the height, weight, waist & hip circumference, Waist-to-Hip Ratio, Body Mass Index and more of the patient. It gathers the physical assessment of the patient through numbers measured visually. Biological Aspects or Biomarkers are internal numbers measured through laboratory examination. These are measurements of specific nutrients within our body and cannot be visibly measured. Clinical Aspect are somehow related to Anthropometric since it is a physical examination. However, we are not getting the numbers here but rather, the physical features that are observed to the patient. It is more about descriptive manner of assessment. Dietary Management speaks through food and eating pattern of the patient. It is like getting a report about the story of a person but are inclined with the question " What did you eat and How much?" It deals greatly about the quality and quantity of the food eaten by the patient including the frequency. Common example is the Food Dairy of any patient with Diabetes. 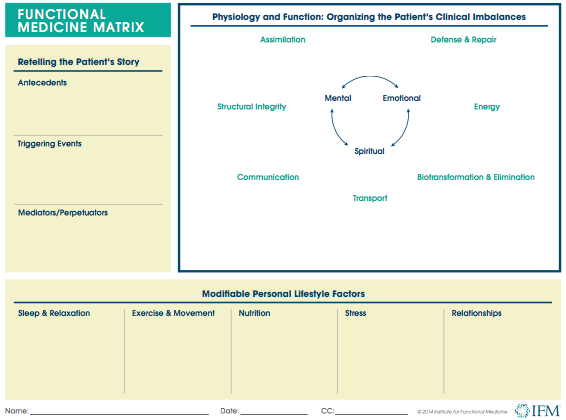 Model Matrix and other materials that the Functional Medicine used are their forms in assessment and record keeping of the patient profile. I will go briefly about these tools. If you want to know and learn on how to use these forms you can visit their website to get the information. (links are given after this post). 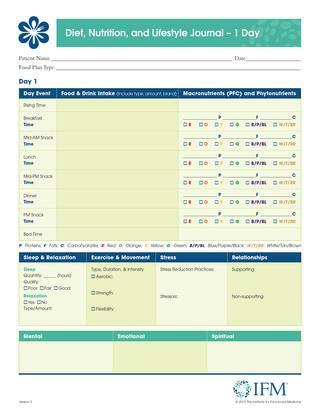 Just like you food diary, the IFM also have an assessment tool for the food and will be evaluate with the results through the PFCMVP (Protein, Fats, Carbohydrates, Minerals, Vitamins, & Phytochemical) Evaluation. I don't have a copy for PFCMVP Evaluation but it just re-evaluate the food intake of the patient. What good about the IFM Journal is that it also assess the variation of the food color and will take that as a step to improve the eating pattern for the patient. After you assess the patient and give different advice, well, it is just the beginning and it doesn't stop their. you have to continue evaluate the progress of the patient profile and re-assess again if their is a need of modification for the treatment. You keep on tracking and tracking to help the patient regain her/his optimal health and nutrition stability. The most simplified explanation about functional medicine is through the Functional Medicine Tree. The base or the root are the factors affecting the growth of the tree. to get better growth, the root should be taken carefully and properly management. Any imbalances from the based will all resort to those complex chronic disease that we usually acquired nowadays. Functional Medicine and Nutrition approach tackles more directly about "what the patient is feeling". It doesn't tell what are the theories are pointing out but rather a more personal approach of asking what are YOU feeling. After attending this webinar, and as I re-write the topic, I felt so proud to be a Dietitian who studied food and nutrition. How magically food can be both a cure and a preventive measure towards complex chronic diseases and to help the person to be in its optimal health condition. But Reality check. 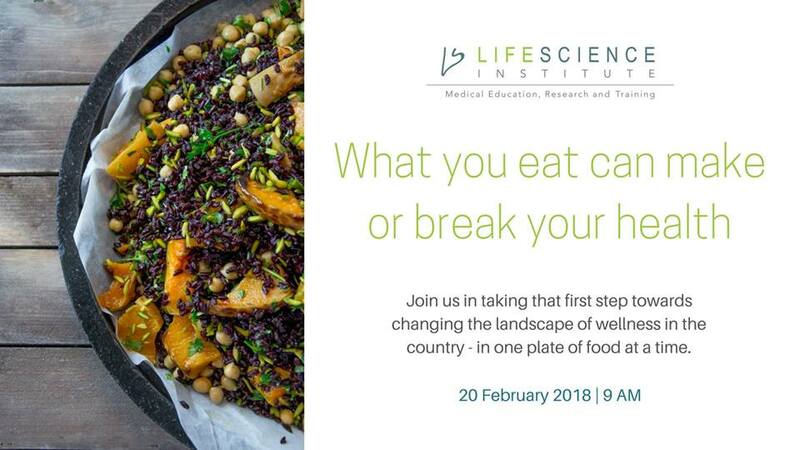 Most of the time, but I'm not generalizing all circumstances, Hospitals and other Health Care Facilities doesn't focused much for these kind of approach especially about "Nutrition". I would also input as well our status in the health professional team. We are not even recognized much in the Clinical Aspect of the Health Professionals. When a Dietitian is working on a Hospital, it become a common connotation that we are Head Cooks or Kitchen Supervisor only, who just prepare food for the patients. Patient also doesn't listen to our advises because we are not their doctors and the endorsement of the patient profile will stop between Nurse and Doctor only unless they order to change the diet. We are seldom recognized as one of the health professionals. It sad but its the truth. It may not be the same in most cases, but it happened. trust me. I really hope and pray that one day, Dietitians will boost its worth in the clinical aspect and will be properly recognized as one of the health professional team. And I hope that through this Functional Medicine, other health professionals even the patients will see the worth of Nutrition as a curative and preventive approach in dealing with chronic diseases. So that's it, I hope you learn something about this post. Please don't hesitate to share your thoughts with me. just comment down below. you can also share this post to spread the news. Thanks for reading! For more updates and information regarding Functional Medicine you can visit their website and facebook page. Just click the links below. Disclaimer: This is not a paid nor used for advertisement purpose. This post is only for the reiteration of the webinar attended by the author but the author is not directly nor indirectly connected to the owners of any material provided. Pictures and information included are properly credited to the primary sources, unless stated differently. Use the contact link provided for further inquiries and questions about this topic.